Answers on those questions just give some raw ideas. I would like to know what exactly stands behind this, an whether there are ways to keep this "standby" from eating my battery? The transceiver circuit is engineered with power saving in mind and will reduce sending power as much as possible if the reception is good. This also reduces the SAR value which is a measurement for exposure of the human body to radiation. If the reception is bad sending signal strength has to be adjusted accordingly. So that's what's really behind it: On poor reception, the device spends a lot of power to find a better/stronger signal (or any signal at all if lost). The following screenshot1 clearly shows those times, when you take a look at the bar titled Phone signal. How to find out where the dead spots are? Apps like No Signal Alert2 and OpenSignalMaps3 monitor the cell signal in background, and record those areas, so they can show you a map of where the dead zones were. 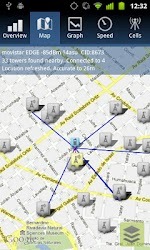 OpenSignalMaps has the plus of showing you all cell towers in reach, pointing out which you are connected to. It also offers you a "compass" giving the direction to the strongest signal. How to automatically deal with those dead zones to save energy? I've reached fairly good results with two apps: Autopilot4 and NoBars Battery Saver5. 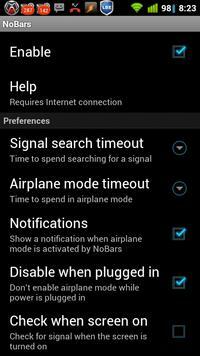 Both monitor the cell signal and, when it drops to far, switch to Airplane Mode for a predefined time. The user can define how long that would be. After that timeout, Airplane Mode gets disabled, and cell monitoring takes over. In the second graph of my question, this shows up as "gaps" in the Phone Signal bar: As the cell radio was disabled during Airplane Mode, no colors are shown; the system didn't know anything about signal strength in this time frame. And with the cell radio turned off, it also didn't use additional power (more precisely, it didn't use any power for this radio then) -- which was exactly what was intended. With Autopilot, the only annoying side-effect was: For each signal check, it flashed on the display for about a second. Aside from that, it gives more options to be configured by the user. However, as the results of both apps where absolutely comparable, those extra options seem not really necessary, while being nice to have. 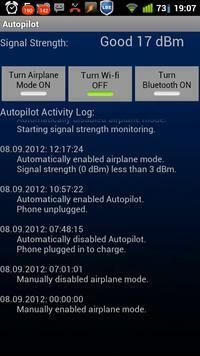 Another plus of Autopilot is the log provided to the user: This way you can see the exact times of mode switches. I've also tested ShutUpBatterySaver6, which aims to handle the data traffic. 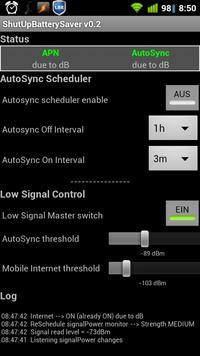 Dropping below a certain signal strength the user can define, it disables AutoSync, and below a second definable level switches off mobile internet altogether. It does, however, never activate (or deactivate) Airplane Mode, so the power used to get a (better) signal will still be the same. Though, with a bad signal data transfer uses more power than with a good signal, as e.g. package loss might be bigger. In the status bar I saw several times that it had AutoSync disabled7, so it seems to work. Not being a heavy data user (as the LBE stats in the same screenshot show), I could however not really tell how much help that brought: Compared to the two Airplane-Mode handling apps above, results in terms of gained battery duration were minimal (if any). It would probably gain best results to join the two approaches. As I was not in the mood to check all possible combinations, I rather decided for the allmighty 6-letter-solution: T-A-S-K-E-R.
As most of you probably know, Tasker is the automation solution on Android. Guess it could even prepare coffee, if our devices had sensors to detect coffee and water. So I created some profiles for this great app -- and results were magnific! %SIGSTATE < 1: check if the signal falls below ~25%. If so, disable mobile data, set %SIGSTATE to 1. %SIGSTATE < 2: check if the signal falls below ~15%. If so, switch to airplane mode, set %SIGSTATE to 2. %SIGSTATE > 0: wait for 5 min, then disable airplane mode, activate mobile data, wait another 15 sec (for the signal to be restored), set %SIGSTATE to 0. 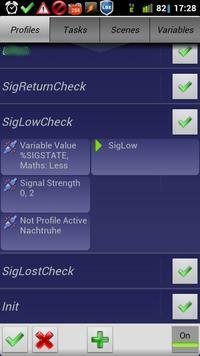 In my global Init profile (which gets executed when Tasker starts monitoring), %SIGSTATE is set to 0 (if it is unset). All 3 above profiles additionally set notifications, as the screenshot above shows9. Each state maintains one notification (which gets replaced when the same state re-occurs), the most up-to-date state is always on the bottom. Results seemed even better than with the two airplane-mode handling apps above, but that might also be due to slightly different signal conditions. So it should at least be comparable. Using one of these 3 solutions, I came home after about 11 hours with about 20% more charge left then without applying any of them. Alert -> Notify Vibrate: Title "IzzySignal"; Text: "Signal Low; Mobile data disabled (Signal: %CELLSIG)"
Alert -> Notify Vibrate: Title "IzzySignal", Text: "Signal Lost; Entering Airplane Mode"
Alert -> Notify Vibrate: Title "IzzySignal", Text "Signal On; Airplane Mode disabled (Signal: %CELLSIG)"
State -> Variable -> Variable Value: Name "%SIGSTATE", Op "Math: Less Than", Value "1"
State -> Variable -> Variable Value: Name "%SIGSTATE", Op "Math: Less Than", Value "2"
State -> Variable -> Variable Value: Name "%SIGSTATE", Op "Math: Greater Than", Value "0"
Now that's just the basic concept, and can be extended with e.g. playing sounds, vibrating, flashing the display, and more. But the energy saving stuff is already in -- and does its job as described. Hope this can help you as well! Another remark: At least with GSM (I cannot tell for CDMA), returning from Airplane Mode by default forces you to enter the SIM PIN. This can of course be switched off -- but in that case this additional protection is also gone when switching on the phone. 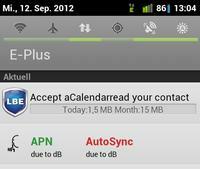 No idea why this is not possible selectively, as it was with my pre-Android phones. In SigLost, instead of Net -> Airplane Mode: On use Phone -> Radio: Off if your phone supports this (my Droid2/Milestone2 does not, unfortunately). If you can do this, the WiFi check becomes obsolete (and your Task cleaner). The counter-reaction in SigReturn then also needs to be changed: Instead of Net -> Airplane Mode: Off, use Phone -> Radio: On. Please let me know in the comments if this removes the limitation of the SIM PIN, as I cannot test it (my device does not support it, as described above). The interesting thing I noticed was that there was multiple tasker icons appearing on the Status bar, which made things confusing as to regards the state that the tasker profiles was running as; I discovered that by setting the Title for the 'Notify Vibrate' in each of the above tasks to be the same, the net result is, one singular notification titled 'IzzyTasker' shows up, with the appropriate message used instead. Not the answer you're looking for? Browse other questions tagged signal cellular-radio battery-life or ask your own question. 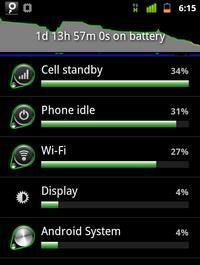 Cell standby use about 35-50% of total battery? Does 'poor' reception deplete the battery quicker? Can I silence only certain notifications during the night? What kind of power saving smarts does Android already have? How to break in a new cell phone battery? How to keep my battery life? Is there anything that can show exactly what has awaken my phone? Why are Dialer, Cell standby, and Phone idle killing my battery? What information can you extract from Wifi networks without connecting?